Last Friday we descended into the bowels of the Art Gallery of NSW. c). what possible reasons they might have given for not going ahead with the show. Man it’s a gorgeous thing. I’d love to be able to display it, as an object, at the exhibition we’ll be having later on this year. The pages are thick and crinkled. After each meeting, pages of minutes are typed up, photcopied and glued in. 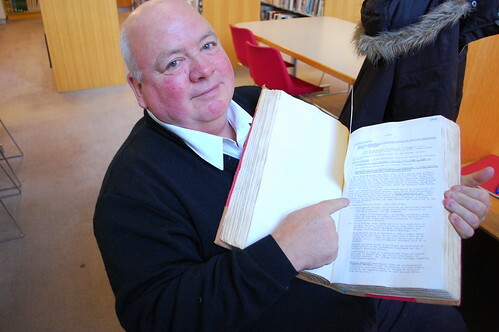 So the book has a really fat feel about it, and the pages crackle as you turn ’em. Anyway, here’s what we found, huddled around the minutebook in the study cubicle: Ian’s original project proposal! Exhibition proposed by Ian Milliss. Gallery Organizer, Frances McCarthy. From Duchamp onwards artists have increasingly questioned the concept of art as a “precious object”, and have concerned themselves with breaking down the barriers between art, life and nature. From the late sixties one of the main movements has been ‘ecology’ art, so called because it is concerned with the landscape and environment. It is art removed from the context of museums, that recognizes that almost anyone can be an artist in the way of his work, in the area of his interests, in the manner that he views the world. P.A. Yeomans is regarded as an “artist” who has contributed more to Australia than any “recognised” artist. 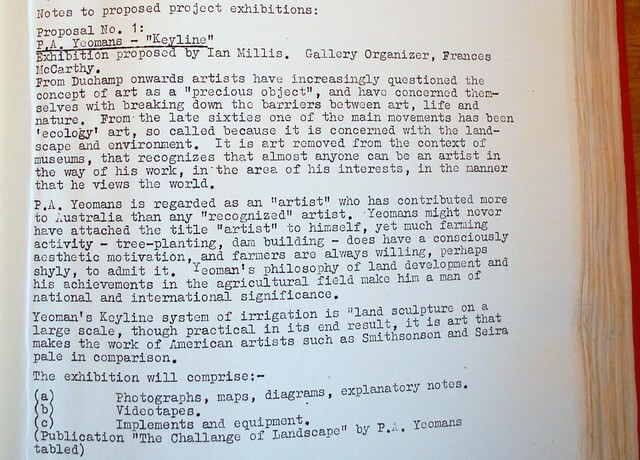 Yeomans might never have attached the title “artist” to himself, yet much farming activity – tree-planting, dam building – does have a consciously aesthetic motivation, and farmers are always willing, perhaps shyly, to admit it. Yeoman’s philosophy of land development and his achievements in the agricultural field make him a man of national and international significance. Yeomans’ Keyline system of irrigation is “land sculpture” on a large scale, though practical in its end result, it is art that makes the work of American artists such as Smithson and Serra pale in comparison. (a) Photographs, maps, diagrams, explanatory notes. (Publication “The Challenge of Landscape” by P.A. Yeomans tabled). 1). Ian’s use of language (straightforward, manifesto-like) hasn’t changed much at all over the last 35 years. 2). Nor has Ian’s key idea changed much, that he’s always banging on about: that anyone can be an artist; it’s all about how you approach what you do in life, and what kind of contribution you make to society. Not only practically, but also aesthetically. 3). 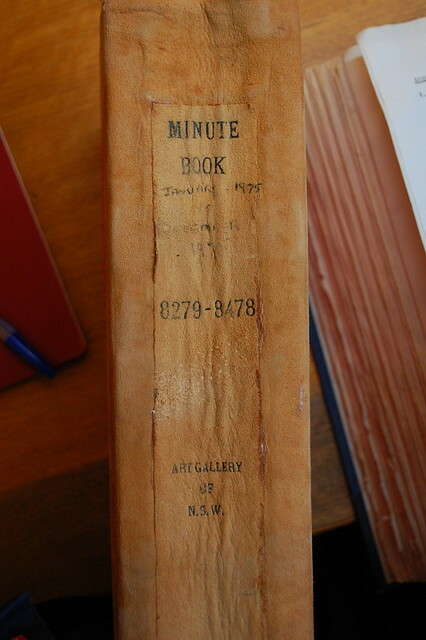 And this is possibly the biggest discovery for me: – the artist under whose name this exhibition was put forward was not “Ian Milliss”, but P.A. Yeomans. Ian (alongside Frances McCarthy) was mooted, rather humbly, as the exhibition’s “organiser” (more evidence of this is on this page of the minutes). RESOLVED by majority that P.A. 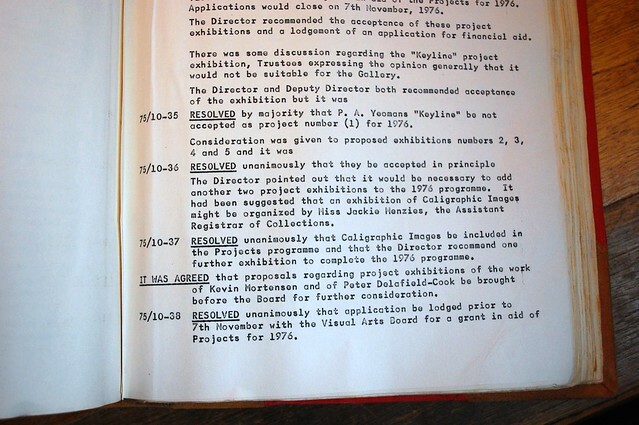 Yeomans "Keyline" be not accepted as project number (1) for 1976. Note – the resolution to not accept the project was “by majority”, not “unanimously”. Who disagreed? And what did they say? *According to the intermaweb, a trustee is “an individual person or member of a board given control or powers of administration of property in trust with a legal obligation to administer it solely for the purposes specified”. The AGNSW lists its current trustees here. This entry was posted in Art, History, Yeomans. Bookmark the permalink. Post a comment or leave a trackback: Trackback URL.